Though the actual origination of the Australian Shepherd (aka – Aussie) is unclear, many agree the development of the breed occurred in the late 1800s. As settlers from countries including Great Britain, Scotland, Spain, Australia and Latin America immigrated to North America, they brought along their favorite herding breeds to control their flocks of sheep. It is unclear whether the ancestors of the breed were native to the Spanish Basque region of the Pyrenees Mountains or from Germany. Basque sheepherders, their dogs and sheep migrated to Australia in the early 1800s, where it is believed that crossbreeding occurred with dogs of the region. However, the Basque dogs were smaller and leaner with wiry coats and without white coloring often found in Aussies. Meanwhile, herding dogs from Germany called German Tigers were brought to Australia in the early 1800s. They became known to Australians as German or Australian Coolies. These dogs, with their merle markings of blue, red, and black with hints of white around the face and collar, have greater similarities than the Basque breed to today’s Australian Shepherd. Even the common combination eye colors – often one eye is blue while the other is brown, hazel, or black – can be traced to the breed’s German ancestors. While Spain and Germany claim a lineage to the Australian Shepherd, it is also thought that Scotch Collies, Border Collies and English Shepherds are all contributors to the Australian Shepherd gene. Due to this history and not surprisingly, Australia does not recognize the breed as native to their continent even though it carries their namesake. Many opinions agree the breed’s name should actually be the “American Shepherd” since the breed has been dubbed ‘made in America’ by ranchers and farmers across the nation. By 1957, the breed was officially recognized with the formation of the Australian Shepherd Club of America, though the current breed description as we know it today was not written until 1977. In 1991, Australian Shepherds were recognized as the 135th breed in The American Kennel Club (AKC) and by 1993 were accepted into the herding group. Throughout history, breeders have maintained the Australian Shepherd’s adaptability, high intelligence and natural herding instincts. In North America, the breed has evolved to include notable characteristics to fit varied weather and working conditions often found on ranches and farms across the United States. For instance, Aussies have what is known as a loose to medium-eye—meaning they do not make constant eye contact with the livestock and instead use their body to control the situation, making them excellent herders. Today, Aussies, while still used as working dogs, are far more versatile. They are trained as guide dogs for the blind, hearing dogs for the deaf, pet therapy dogs, drug detectors and search and rescue dogs. Aussies have a medium length, medium textured, weather resistant coat. They are robust and well balanced and born with a natural bobtail. These rambunctious charmers are especially known for their unique variations of eye colors, which include blue, brown and amber, and sometimes a combination of any two. 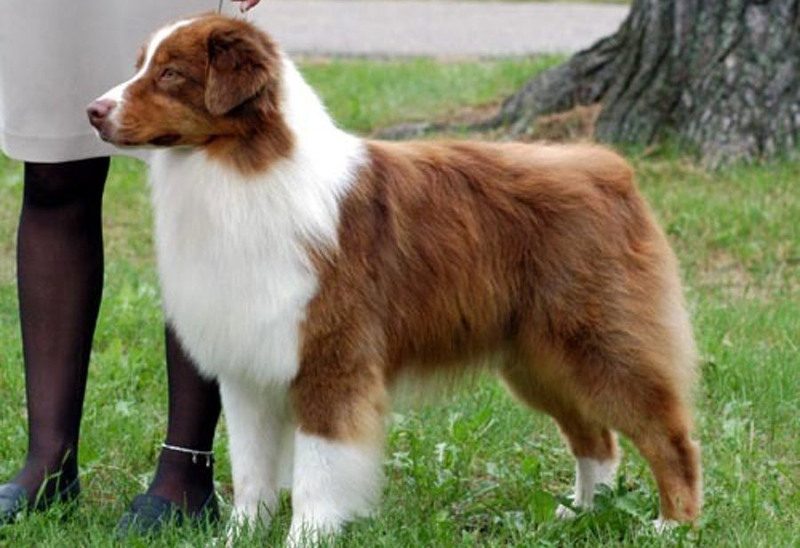 Height from withers(ridge between shoulder blades): 18-23 inchesAverage Weight:Males – 50 to 60 lbs, Females – 40 to 55lbsCoat Color: Aussies have four basic coat colors — Black Tri, Red Tri, Blue Merle and Red Merle. Background and spot color as well as spot size vary to form a beautiful and unique look for each dog. Black Tri Aussies are black and white with copper points; these colored dogs look the part of traditional farm dogs and generally do not have multi-colored eyes. Red Tri Aussies range in color from light cinnamon to dark red and typically portray a blend of red and white with copper points. These dogs, much like the Black Tri’s, look like traditional farm or ranch dogs and also generally do not have multi-colored eyes. Blue Merle Aussies however, often have multi-colored eyes and display a coat of various sized black spots on a gray background, making the coat look “blue”. Like Blue Merles, Red Merle Aussies also often have multi-colored eyes. Their coat is a combination of red patches on an off-white background. Grooming Needs: Surprisingly, the thick Aussie coat needs little attention. Generally, a healthy coat sheds dirt on its own. A simple occasional brushing of the topcoat with a firm bristled brush and regular bathing is all that is needed. A ‘slicker brush’ —designed to remove undercoats — should be used during shedding season. The even-tempered Australian Shepherd is generally friendly to most; however he can be reserved with strangers making it crucial to socialize him with a wide variety of people to help develop good social behavior. Keep in mind, Aussie’s maintain a puppy-like personality throughout most of their lives. They are loyal and are naturally protective of their families and are very intelligent, affectionate, lively and eager to please. Aussie’s make a great family dog. Good with children? Yes! This intelligent breed is smart enough to recognize the difference between children and adults and is often protective of younger children. An energetic breed, he loves to run and play with older active children and adults. Good with other dogs? While Aussies are not usually dog-aggressive, temperament towards other dogs is based on how well she is socialized as a pup. Good with cats? As with other dogs, she will get along with cats, as long as she is socialized to them at a young age. However, Aussies are natural herding dogs and have been known to herd cats and other animals or family members. Good watchdog? Aussies are very protective of their owners and make a great watchdog for your home. Easy to Train? Aussies are very intelligent and eager to please, making them very easy to train. Their high intelligence and energy makes them wonderful performers in obedience and speedy agility competitors. Can be left alone? While Aussies can be left alone, these densely-packed bundles of energy require a larger sized house and yard as they live a very active lifestyle. Barker? Unless he is given enough exercise and mental stimulation, an Aussie can be a heavy barker. Activity level? Aussies are very high-energy dogs. Vigorous daily exercise will keep them active and happy. Without activity, he will generally become bored and frustrated which can turn into behavior problems. Just give your active Aussie a job in order to make him feel like he is accomplishing something.